Surplus Czech CZ82 / CZ83 magazine. It will hold 12 rounds of .380 for the CZ-83 or 13 rou..
Czech VZ58 30rd 7.62x39 magazine. These magazines are in good to very good conditi..
Czech VZ-58 30rd 7.62x39 magazine in fair condition. May have dings or may have been poorly refinish..
MecGar CZ-75 10 round 9mm magazine with blued finish. Mec-Gar manufactures the OEM factory mags..
MecGar CZ-75 16 round 9mm magazine with blued finish. Mec-Gar manufactures the OEM factory mags for ..
MecGar CZ-75 19 round 9mm magazine with anti-friction coating. Mec-Gar manufactures the OEM fac..
Mecgar CZ-75 compact / P-01 14 round 9mm magazine with blued finish. 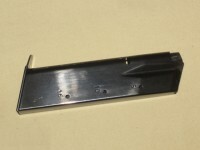 Mec-Gar manufactures the O..
CZ-75 PRE-B 16 round 9mm factory magazine, new. ..
Czech CZ Scorpion Evo factory 30 round 9mm black magazine with round count windows. 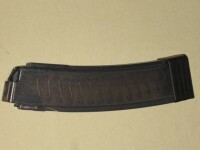 ..
Czech CZ Scoprion Evo factory 30 round 9mm magazine. ..
Czech CZ Scorpion Evo factory 10 round 9mm magazine. ..
Czech CZ Scorpion Evo factory 20 round 9mm magazine. ..